@Darth_Awakened Oh no, poor Finn! He hates sand! I just remember hearing Simon Pegg on Mark Moran's podcast and Moran asked him about Star Wars, so he talked about writing his grad school thesis. People who claim to be "the biggest Star Wars fan ever," take a number get in line. That's not some unique quirky personality trait, it's like following sports. But somebody who loved it and thought about it enough to devote serious academic research to it and defend it in front of their Master's Thesis committee, that's on a completely different level. So, of course, he'd have a small pivotal role as a character who's central to the experience which traumatized and shaped the central protagonist. @Rei of Sunshine - You notice that he has never said anything other than talking up her help and saying she'd be his choice for directing one of those films? As diplomatic as what Johnson (who I'd guess never wanted the responsibility of IX and still has his legal battle over VIII hanging over his head) said about Trevorrow, JJ's never even said anything ever about him. Just that he though Ava would be amazing. And Carrie Fisher was talking up that point in all of the interviews before her death, about the whole 'double standard in space' about why Leia never got big Force moments, was the only women in the entire galaxy, or even the fight she had over RotJ with acknowledging that she's in a bad situation too with Jabba (she ad-libbed a sarcastic "dont' worry about me, I'll be fine" to Han and Luke and the director yelled at her). It sounds like LF is more than aware of it, but that's where doesn't JJ have somebody he works with who's a woman and a writer who'd be a more appropriate choice? I've only seen one movie this guy did, Argo. Which was okay but he's certainly not in the same league as Fisher, Kasdan or Johnson when it comes to being a writer. I think antis just utter things to make themselves feel better or maybe they think if they just say it, it makes it true, lol. I wasn't sure who I wanted to direct IX... now that JJ has been announced I feel like that gives us an idea where we're headed and I'm not unhappy with the choice. My first reaction was oh really, they are choosing the "save" way and reading KK words in the statement makes it clear they were very happy with the success of TFA and since there has been enough trouble already with directors in the franchise, you fall back to what you know! So JJ is the savior, the new director of Episode 9. I preferred RJ. 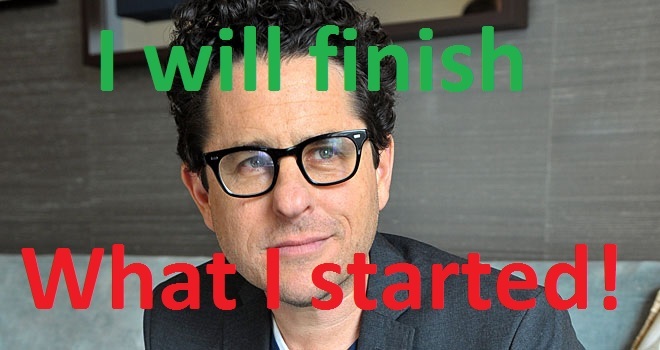 But I don't have any problem with JJ as long as he won't make another death star or take too much "inspiration" from other Star Wars movies and I am sure that he won't do that. It is another happy day in the fandom! PS: You should be happy. Now I really need to rethink the possibility of romantic Reylo. Probably I won't be fully on board with it until I see it on screen. But JJ is someone who would want to make it. He was the one who was the first to officially describe Kylo as a prince. Don't they always, ever since TFA came out and Reylo smashed their plans into little pieces. @Blood Moon wrote: My first reaction was oh really, they are choosing the "save" way and reading KK words in the statement makes it clear they were very happy with the success of TFA and since there has been enough trouble already with directors in the franchise, you fall back to what you know! I don't know anything about Terrio but I have seen Argo and BvS. Argo had it's moments but there was just a certain slowness to it. And despite the supposed dangerous situation the characters are in, I didn't feel the urgency that much. Maybe it had to do with the fact that it was based on actual events and they had to embellish the story a bit to make it fitting for a thriller. As for BvS, that was a mess. There were some promising parts to it, such as Diana, and the hype for the Justice League and all of Bruce's snooping detective work, but the rest was just a mess, which I think I'll blame on Zack Snyder. Maybe Terrio specializes in writing action plots, or detective work and stuff like that. That seems to be the common denominator for Argo and BvS. Maybe, just maybe, JJ will write for the characters and their motivations and all the emotional parts, and Terrio balances that our with the gritty action stuff that fanboys will love. I'm reading the comments on Star Wars Union (german fanpage) - the reactions aren't so bad (I thought they would be worse). Most would have preferred RJ but they think JJ ist a much better choice than CT.
We have a considerable spike in attendance today compared to the last few weeks. 31 people; 5 guests, 12 hidden, 14 registered. I wish more people would log in to celebrate! @Night Huntress wrote: I'm reading the comments on Star Wars Union (german fanpage) - the reactions aren't so bad (I thought they would be worse). Antis are so scared, ha,ha! "And he just looks like a sort of prince"
"But because he's taken her, you get a sense that there might be something else going on"
"Very interesting relationship moving forward"
"And now these two disparate pieces..."
@vaderito Based on some couples JJ has done on his shows and movies etc, I am so ready for hot heavy reylo episode 9. omgggg. I'm not sure how to feel about this. While I enjoyed certain aspects of TFA (mainly Kylo and the Reylo dynamic), I thought that it was overall a very flawed film (too fast paced, too many callbacks, some poorly written characters). I hope Episode IX won't have the same issues. @rey09 wrote: @vaderito Based on some couples JJ has done on his shows and movies etc, I am so ready for hot heavy reylo episode 9. omgggg. probably the most iconic love scene on TV. Funny enough I felt kind of dead inside after that VF article (well that is a bit of exaggeration), but honestly, there has been only good news after that. I mean cmon, all the stuff Rian has said, Adam being cheeky about Kylo's ark, now JJ returning. @Lucina wrote: I'm not sure how to feel about this. While I enjoyed certain aspects of TFA (mainly Kylo and the Reylo dynamic), I thought that it was overall a very flawed film (too fast paced, too many callbacks, some poorly written characters). I hope Episode IX won't have the same issues. JJ had the burden of making a sequel 30 years after the last one (ROTJ) and ofc the pressure of making it live up to the Star Wars name. His major problem was to create a world for a new generation, with new characters and new problems, and to put that side by side with what makes fans love Star Wars so much, the nostalgia. He also needed to draw in old and new fans together. There were too many new and old characters all together. All that crammed in 2 and a half hours would definitely feel very fast paced. Admittedly it wasn't the best, and could've been more cleaned up, but it the job of setting the ST into motion. Now doing the last film of a trilogy is different from making the 1st. This time around, JJ has Rian's TLJ to build upon. And since Rian mentioned observing how JJ worked on TFA, it seems that there is will be a cohesive flow from TLJ to Ep IX. JJ's main problem here now is to put a satisfying resolution to the ST and the characters he created. This time, it's his work he's trying to finish, and not a trilogy done 30 yrs ago. I just read about it and i am sooo happy!!! Even though we don't know what's ST endgame in any aspect, I feel much better that direction is given to the Original Reylo. JJ is the reason why this fandom exists. Also, this is a nice vindication cause obviously a proper reading of TFA is important. And that Reylo is the first thing that popped on antis mind upon hearing about JJ is the best vindication of all! I am relieved. JJ produced such an intriguing relationship between Kylo & Rey, that it's highly unlikely that he will abandon it. It was still subtle enough that I wondered if subsequent directors planned to abandon that plot line. I also loved TFA, particularly the way it used callbacks and recurring themes from the OT. (unpopular opinion?) It's like musical theme and variations. Or re-telling a mythic journey, but with different characters to give you a new perspective on a familiar story. @vaderito wrote: Even though we don't know what's ST endgame in any aspect, I feel much better that direction is given to the Original Reylo. JJ is the reason why this fandom exists. JJ is back because he needs to correct all the mistakes he did in TFA! Like Jedi!Finn, Rey Skywalker, and Luke's silence. So for Ep IX, Finn will be a Jedi, Rey is a Skywalker, Kylo dies, and to make up for his silence in TFA, Luke will have half of all speaking parts. Also Chewie needs that hug from Leia. Mrs Ben Solo wrote: JJ did it on a deadline for TFA and he will be doing the same here, I presume. I could see KK and Disney/Lf being willing to push the release date back to December '19 but they won't want to go past that. I'm seeing quite a lot of negative reaction to the news on social media but this is coming mostly from the old fan boys and people who hated a lot of what JJ (& LK) brought to TFA. Who really cares what they think anyway when TFA was the highest grossing Star Wars movie and plenty of fans love the new characters etc. I'm sure the antis are drowning in salt, poor things! I'm reading a lot of concerns about Chris Terrio, and I confess I'm not familiar with his work. Argo seems to be the exception rather than the rule. But JJ is co-writing, plus I'm sure they'll have plenty of input from elsewhere, including Lawrence Kasdan. The view from Reyloville is looking pretty damn good right now, lol. Just goes to show that LF/Disney care about results more than minor fan repercussions. People have been b****ing out JJ for over two years, but it was hilariously naive for some fans to think their boo-hooing over Rogue One vs. TFA and "he lied about Khan" would matter in the slightest. He was still the appropriate choice. TFA earned tons of money, positive press and was met with universal acclaim by reviewers (92% on Rotten Tomatoes is far from shabby). Anyone who wants to call TFA a failure obviously knows nothing about how big film studios operate. JJ isn't back because he made the greatest film of all time, he's back because, from a standpoint of company safety and trust, he made a movie that checked all the boxes that needed checking. No I haven't heard cause I've heard that TFA made 2 billion without Jedi!Finn, Reywalker/Soloist, prominent Luke, scary Kylo, etc.